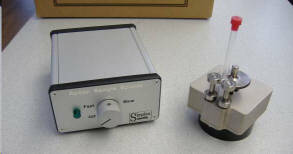 The Patented* Simplex Scientific Sample Spinner is designed to slowly rotate a vial while the contents are being analyzed. 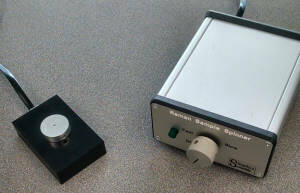 In Raman Spectroscopy, rotating the vial minimizes undesirable heating of the sample by the laser and enables detection of properties from a larger representative portion of the sample. 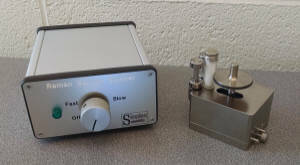 This accessory automatically adjusts to accommodate capillary tubes and vials of various sizes. Versions avaliable for use with Bruker XYZ stage, Thermo Fisher and a universal mounting plate for other systems.